A banana is mostly made of water. Water is a liquid. The room temperature banana is too soft and mushy to hammer in a nail. Imagine trying to hammer in a nail with a water balloon. Freezing the water in the banana is one way to make it a better hammer. The water molecules in the banana start to slow down when you make them cold. They start holding onto each other more tightly, like the volunteers in the earlier demo. When the molecules get cold enough, the water in the banana becomes a solid (ice). With a frozen banana, the nail can easily be hammered because the solid water is much more rigid and tough than the liquid. DO NOT reach into the LN2 with the cryo gloves. The LN2 soaks into the gloves right away and traps it near your hand. Use the crucible tongs to fish the banana out of the LN2 (it sinks to the bottom). 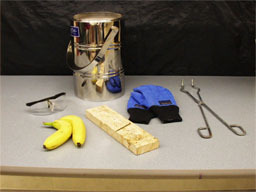 The banana may break when hammering in the nail if it was left in the LN2 too long. About 30 seconds to a minute is a good amount of time. Make sure the kids don't grab pieces of banana. It stays cold for a long time, and will hurt their hands. Have fun with this demo! Its purpose is to show a liquid to solid transition, but it has always been funny to perform and watch. Ham it up. Have someone drop a banana into the LN2 right at the beginning of the demo. That way it will be frozen by the time you need it, but not so frozen that it will totally shatter. Explain that you need to hammer a nail into the board. Unfortunately, the only thing you can use (or find, whatever) is a banana. See if the audience thinks it will work. Regardless of the response, tell them that YOU think it will work, and you're going to do it. Hold onto the nail, just in case it's near a previous hole. No matter what, make sure that the nail doesn't go into the board for this part. Messy = funny. Make sure the banana goes all over the place, but try not to launch banana sectors at the audience. Comment on why that didn't work so well, and have someone fish the banana out of the LN2 carefully with the tongs. Explain that the banana is mostly made of water (if you want, you can ask them and see if they guess this). Liquids don't make very good hammers. By this time (about a minute, but no less than 45 sec.) the banana should be solid enough to use as a hammer. Remove the banana from the dewar with the tongs and hold it with the glove. To make sure this goes smoothly, you may want to position the nail over a previously made hole.